Raised as the child of Cambodian immigrants in Los Angeles, Andrew Hem’s illustrative paintings bridge disparate aesthetic influences as well as cultural touchstones and sensibilities. Hem’s paintings typically highlight an individual within a group of figures, homing in on the one person who is often somberly staring out from the canvas. Using a cool palette in which the colors do not quite match up with the real world, the artist creates somber moods in illusionistic spaces set at a remove from reality. Although his color scheme—with its supernatural rendering of the natural world—elicits comparisons to impressionism, Hem also echoes graffiti art based on his straightforward and illustrative rendering of figures and space, as well as allusions to street culture, art, and fashion.Andrew realise is first wall in Italy on Memorie Urbane 2017. 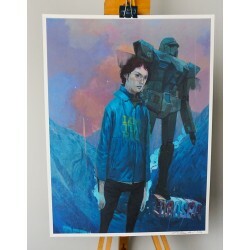 Andrew Hem There is 1 product.